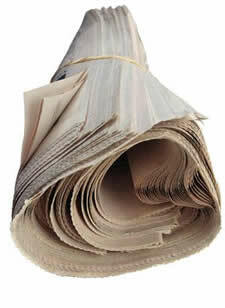 Recently a friend introduced me to the affectation of carrying a rolled up newspaper as one proceeded about ones day. His logic was simple; without this paper sword the modern man is defenseless against the hustle and bustle of urban combat. Picture the scene, you are perambulating through a metropolitan area. You have halted at the edge of a road to permit traffic pass when some careless pedestrian, perhaps nattering on a telephone, makes to walk under an approaching delivery lorry. Rather than suffer the indignity of being delayed by the authorities to describe the ensuing incident you decide to physically stop the cretin from self damage. Naturally physical contact with the oaf is undesirable; a medium is called for - a folded up newspaper allows one prevent a scene while keeping you from breaking a sweat and your precise schedule isn't interrupted. The folded up newspaper is an all year round version of the brolly, with the added distinction of displaying, to the discerning observer, an introduction to the depth of culture of your character. A man of business may carry the distinctive pink hued FT, the Munster expatriate the Examiner and the legal eagle the Times. Perhaps the beauty of the rolled up journal is that its appeal is without social boundary. Modified automobile enthusiasts wouldn't be out of place with an issue of the Auto-Trader tucked as they walk to their jalopies, bookie-dwellers might improve their odds with a copy of the Herald underneath whereas Fianna Faillers might do well to have the Indo, open on the Letters Page. The uses for this vessel extend far beyond merely reading it. As suggested, it can be used to stop people from walking into traffic - however much that action would play homage to Darwin's theory. Another is its use to swat at flies buzzing in your vicinity (human and insect). It would be presumptuous of me to suggest that I have presented each application of this daily digest - fortunately the newspaper has a medium for feedback in the form of the Letters page where one can present their concepts for peer review. Despite the social background, and choice of reading material carried, the mere fact that a passer-by possesses a folded-up-newspaper displays a higher state of consciousness of the world they live in.